Just five years ago, the land that now houses the newly formed Lamplight Community Garden was nothing more than a vacant, 2-acre field designated by the City of Austin as Alderbrook Pocket Park. The first major change to the land occurred in late 2014, when the park was used as part of a water conservation pilot project led by the Austin Parks Foundation. The pilot utilized Habiturf, a mixture of native southwestern grasses like blue grama, curly-mesquite, and buffalo grass that establish quickly and require very little watering. Along with covering the soil with Habiturf, several pounds of bluebonnet seeds were planted throughout the park. Over the next four years, the bluebonnets would bloom each spring, solidifying Alderbrook Pocket Park as a popular place in northwest Austin to take annual pictures among the wildflowers. At the end of 2017, residents of the Lamplight Village area near MoPac and Parmer Lane took park improvements into their own hands by developing plans for a demonstration garden dedicated to creating a sense of community in their neighborhood. Shortly after, fiscal sponsorship was secured from Sustainable Food Center, and garden permits were filed with the City of Austin Parks Department. Residents Vit Kaspar and Rodney D’Souza have been heading the leadership team working to make this community garden possible. When asked about their aspirations for the project, they stated, “This demonstration garden will create a space for gardeners and would-be gardeners to gather together, learn from one another, and create a sense of community in our neighborhood.” Kaspar, a seasoned gardener, hopes that having both individual raised beds and a large in-ground plot will inspire neighbors to work together and share both the fruits of their labor, as well as the skills they learn along the way. The garden is currently in the first phase of building, with volunteers working hard on fence construction and soil preparation. They are also working to secure the water tap installation at the garden site through the City of Austin. The garden should be open to the public in March 2019 following an official opening ceremony. The success of the Lamplight Community Garden will rely on the support of the community, mainly as volunteers, to help the garden thrive in its first year of establishment. 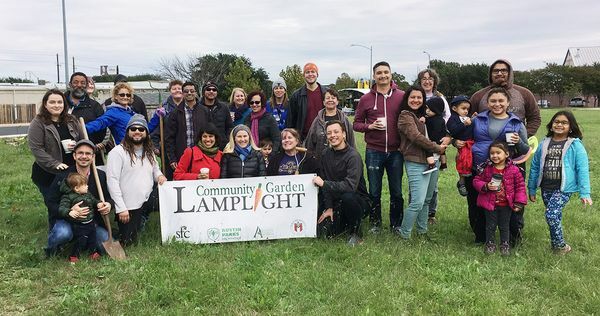 For more information about the Lamplight Community Garden and how to become a member, visit their website or Coalition of Austin Community Gardens.